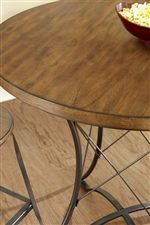 Perfect for a small dining space or breakfast nook, this counter height dining set offers a sleek, modern industrial appearance. The contemporary group features wood table tops and seats supported by metal bases for a refined urban look. Sitting at a taller height than an average dining set, this counter height group represents a fresh take on contemporary casual dining. The Adele Industrial Counter Height Dining Set with Metal Bases by Steve Silver at Walker's Furniture in the Spokane, Kennewick, Tri-Cities, Wenatchee, Coeur D’Alene, Yakima, Walla Walla, Umatilla, Moses Lake area. Product availability may vary. Contact us for the most current availability on this product. Defined by metal bases and wood tops, the Adele dining collection presents refined industrial style. The counter height dining group puts a fresh twist on casual dining, and brings modern style to the forefront of any space. 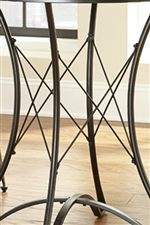 Geometric designs on the table pedestal provide a chic accents, while the warm finish of the wood table top and stool seats adds a natural touch. Perfect for a small loft or breakfast nook, the Adele collection offers a space-saving design with distinctly contemporary style. The Adele collection is a great option if you are looking for Contemporary furniture in the Spokane, Kennewick, Tri-Cities, Wenatchee, Coeur D’Alene, Yakima, Walla Walla, Umatilla, Moses Lake area. Browse other items in the Adele collection from Walker's Furniture in the Spokane, Kennewick, Tri-Cities, Wenatchee, Coeur D’Alene, Yakima, Walla Walla, Umatilla, Moses Lake area.